here it is the screen air filter for limitless flow that fits on mikuni carburetors with 44mm ID like the 24mm , 28mm flat slide carbs and the mikuni round slide vm20 and vm22 carburetors. 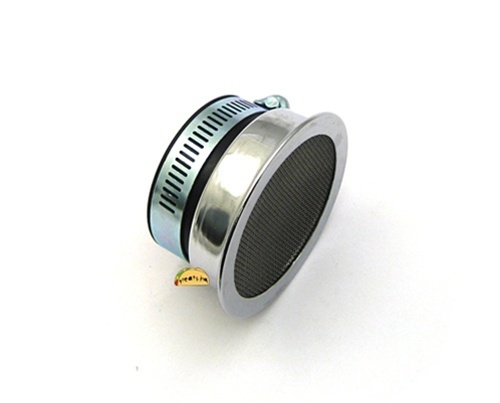 This is an excellent option for when the mikuni filter keeps getting clogged with fuel. Your bike wants to breathe, let it. I have been rawdoggin random roadways for about 100 miles with upjetting and a temp gauge. The only problem is the screen pictured appears to have smaller openings, the screen that came on this isn't like to stop sand (a concern in Fl), but will make you feel more secure than an unscreened velocity stack.